On day 8 we decided to roll the dice and try a restaurant we had walked by several times, Shanghai Cuisine. Check out the reviews on line for this restaurant and you will see a 50/50 split of people who love the place and those who think it is one of the worst experiences they have ever had. What brought us in were all the posted reviews from local papers and praises from various chefs like Ming Tsai and Eddie Haung. Any place as polarizing as this one was was worth checking out. Shanghai Cuisine bills itself as a throwback. Eating there is supposed to evoke Shanghai in the 1930s. I can't attest to how authentic it is, but I can attest that it is a throwback. 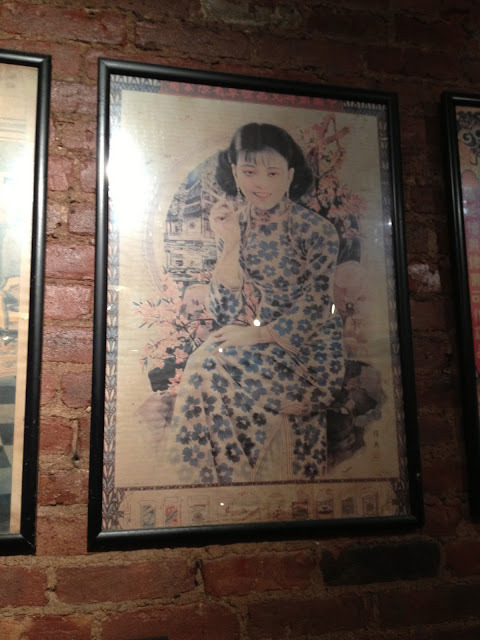 Shanghai Cuisine fully embodies what it was like to go out for Chinese in New York City in the 70s and 80s. The waiters wear black pants, white button downs and black bow ties. The restaurant is decorated with red lanterns, fake strings of firecrackers and other festive decorations. The nod to 1930s Shanghai are the portraits of women is 1930s garb. The tables are covered in red checkered cloths. There is a full bar in back. The menu has all the "Chinese Food" classics as well as more "authentic" dishes. I could imagine myself here in high school, getting dinner and ordering a Sloe Gin Fizz, knowing the waiters never carded. A little sweet and savory and very tasty. At this point I was an expert on soup dumplings. 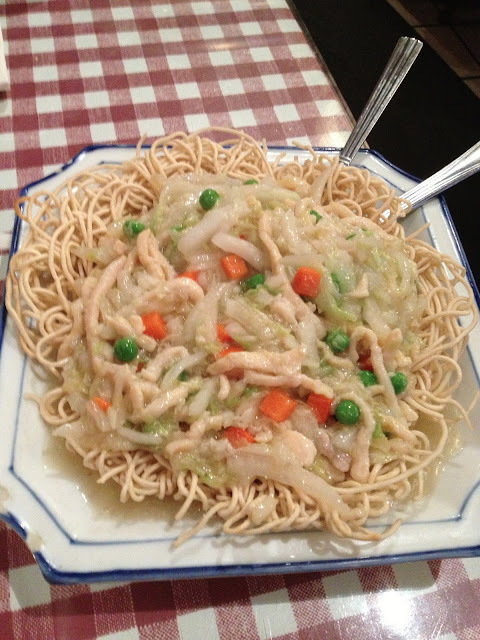 Shanghai Cuisine's are great. I was not sure what to expect from this dish. 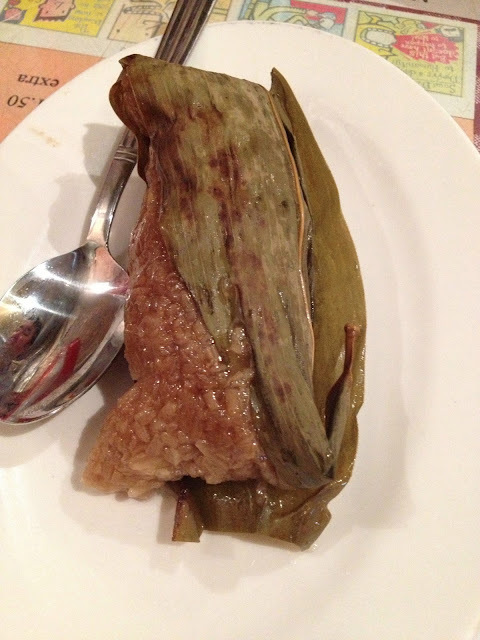 It was listed under "Traditional Shanghai Cuisine in 1930s." When it arrived I was a bit disappointed. It looked like strips of pork with the life fried out of it. One bite changed my tune. It was delicious. The pork was tender and moist. The breading was light with no hint of grease. The seasoning was excellent. A perfect balance of salt and pepper with a wonderful, savory tang from the garlic. I would return for this dish. Had to do it. Never my favorite, but just had to order it. It was fine. Shanghai Cuisine is more expensive than a lot of the other restaurants in Chinatown. I can't say I would make it one of my go to spots, but for a touch of nostalgia, and some good food, it is worth the occasional visit. It is the perfect place to take the family when they come to visit from Ohio and want to go to Chinatown for "real" Chinese food. You and I both know they want Sweet & Sour Pork and General Tso's Chicken. Shanghai Cuisine fits the bill. They will love it. And you can slip in some "real" Chinese food to boot.